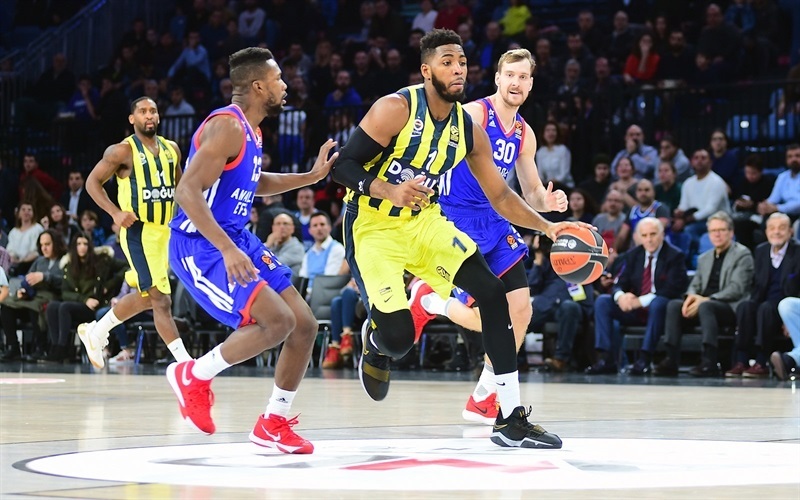 Fenerbahce Dogus Istanbul grabbed its fourth consecutive win in the Turkish Airlines EuroLeague regular season by downing cross-town rivals Anadolu Efes Istanbul 84-89 at Sinan Erdem Dome on Friday. Fenerbahce improved to 13-6 in the standings while Efes dropped to 5-14. 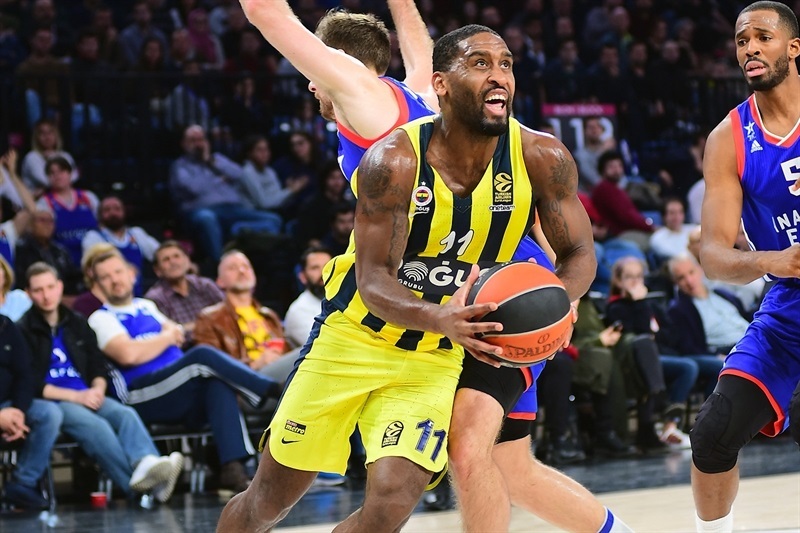 Brad Wanamaker led the winners with 18 points. 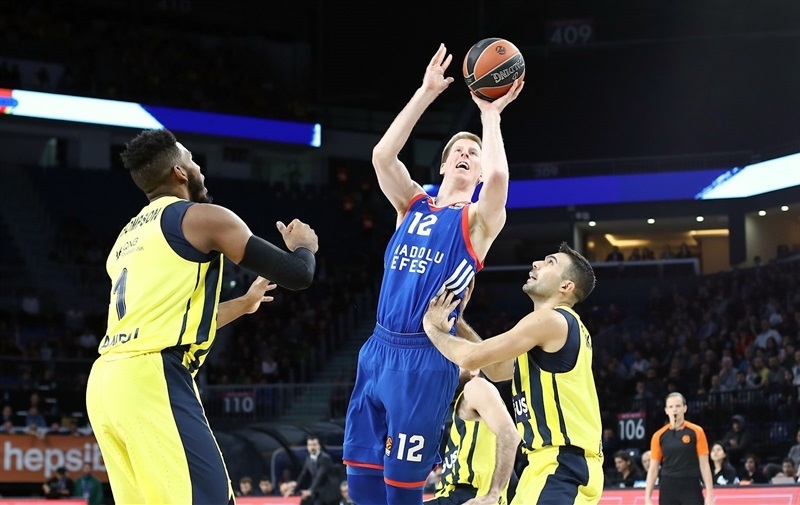 Melih Mahmutoglu got 16, Nicolo Melli added 14 while Jan Vesely and Marko Guduric each had 12 points apiece for Fenerbahce. 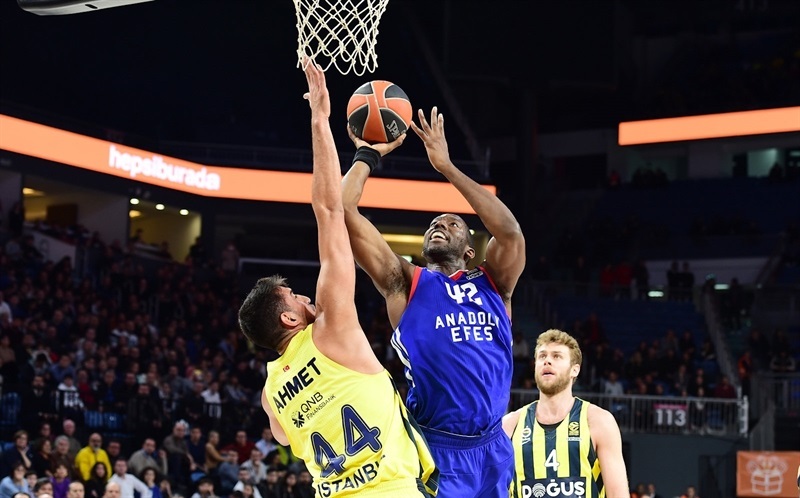 Toney Douglas led Efes with 29 points and just one missed shot while Errick McCollum added 18. Douglas led a 10-0 opening run but Wanamaker and Guduric stepped up for Fener and Ahmet Duverioglu dunked for a 24-24 tie after 10 minutes. Mahmutoglou had 14 points in the second quarter, getting plenty of help from Melli to give Fenerbahce a double-digit lead, 35-46, at halftime. McCollum took over after the break, bringing Efes within 44-49. 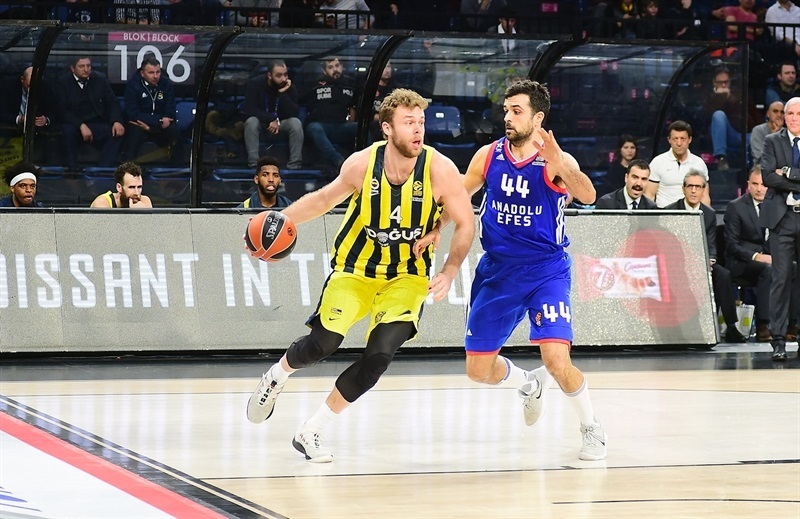 Fenerbahce found a go-to guy in Wanamaker, who joined forces with Vesely and Marko Guduric to keep the guests way ahead, 57-68, after 30 minutes. 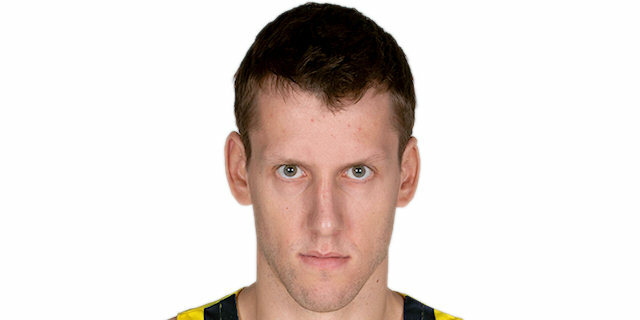 Douglas hit a couple of jumpers and each Brock Motum and Zoran Dragic added a layup-plus-foul to make Fenerbahce call timeout at 10-0. 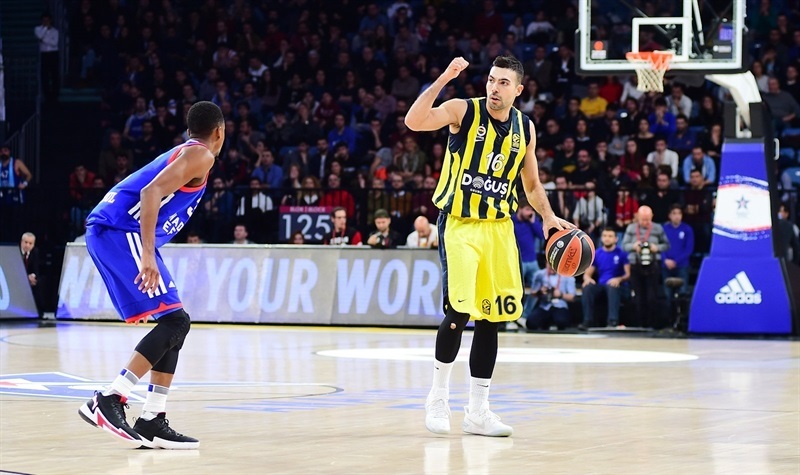 Kostas Sloukas rescued the visitors with a jumper, Vesely dunked and Wanamaker followed a triple with a coast-to-coast layup for an 11-9 Fenerbahce deficit. 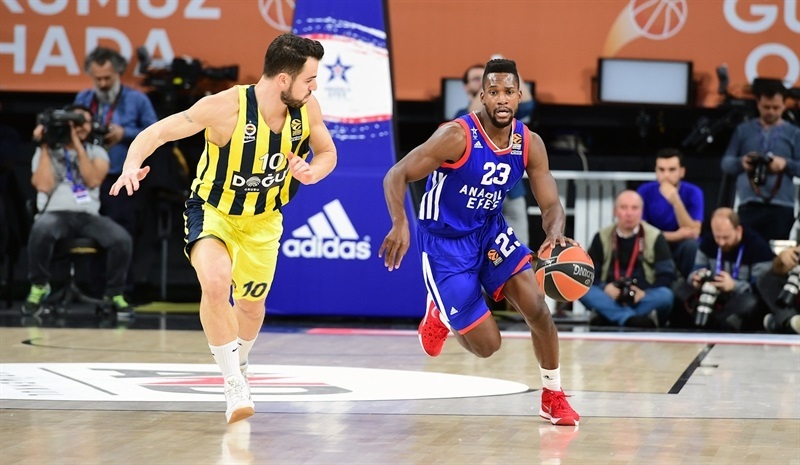 Bryant Dunston and Douglas made free throws and Dragic added a jumper and a three-point play for a 20-15 Efes edge. Wanamaker and Guduric stepped up for the guests and a dunk by Duverioglu tied the game, 24-24, after 10 minutes. Mahmutoglu sank back-to-back triples early in the second quarter. McCollum hit a jumper and Dunston added free throws but a red-hot Mahmutoglou followed Ahmet Duverioglu's dunk with another three-pointer and added a jumper to put Fenerbahce full in charge, 29-38. 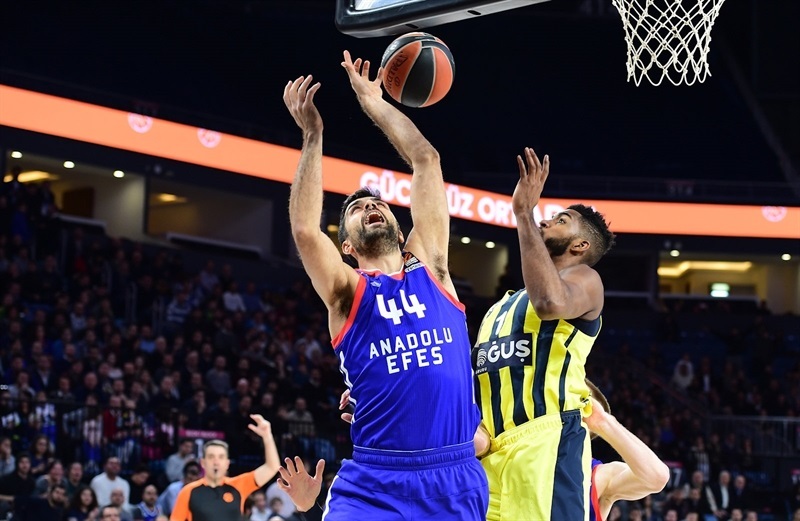 Douglas downed a rainbow jumper and McCollum did better with a three-pointer, but Mahmutoglu made free throws and Melli struck twice from beyond the arc to restore a 35-46 Fenerbahce edge at halftime. Krunoslav Simon hit an off-balance jumper right after the break and McCollum followed a wild four-point play with a bomb from downtown to bring Efes within 44-49. 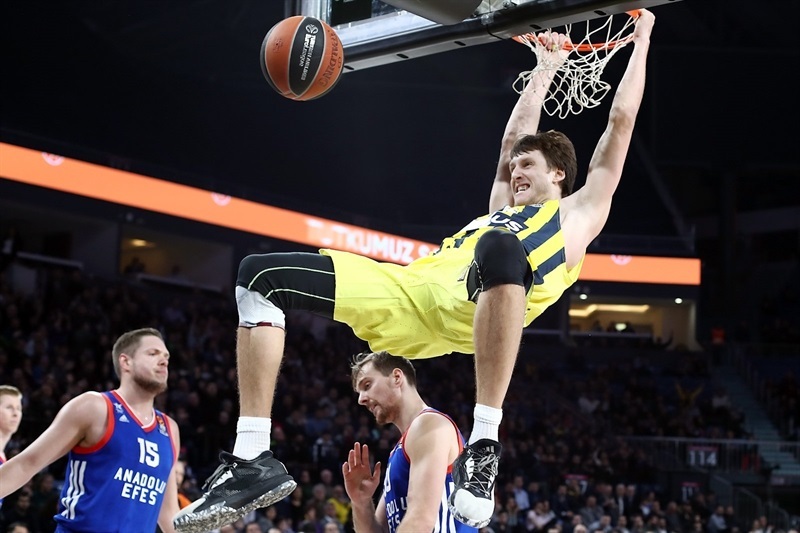 Wanamaker answered from downtown and fed Vesely for a dunk that restored a 44-54 Fenerbahce margin. Stimac stepped up for Efes and Derrick Brown dunked but three-pointers by Guduric and Ali Muhammed kept the guests way ahead, 53-64. Dunston dunked and McCollum added a jumper but free throws by Wanamaker gave Fenerbahace a 57-68 lead after 30 minutes. 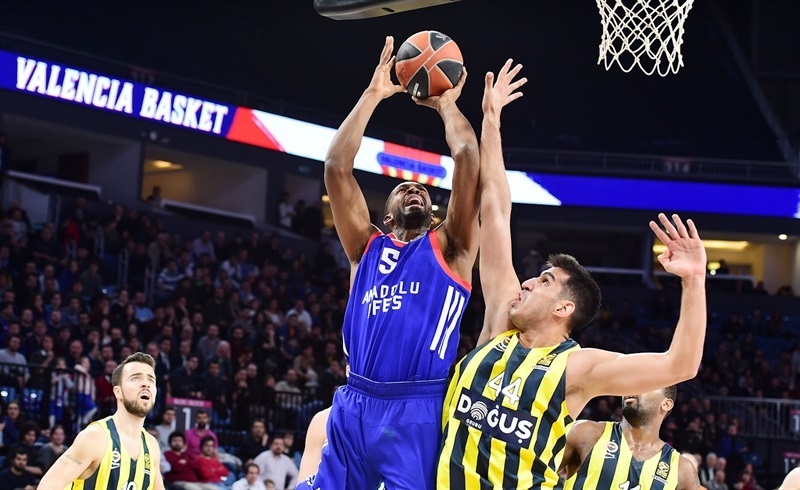 Douglas hit a jumper and buried three consecutive shots from beyond the arc to give Efes plenty of hope, 70-76, midway through the fourth quarter. Vesely stepped up with a work and Guduric added a three-pointer that sealed the outcome, 70-81. 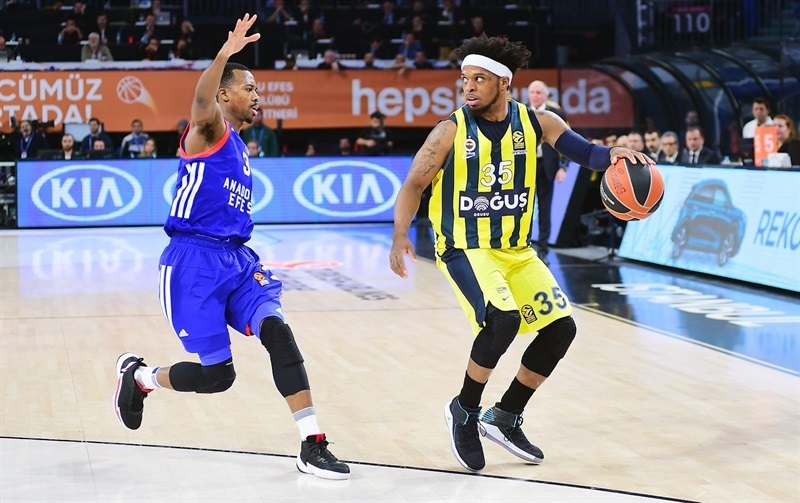 Efes never gave up but Fener kept full control until the final buzzer. "In the second half, we continued to keep the difference we had at halftime. Not so many good decisions in some moments offensive and also defensively, in one-on-one game. They tried the isolation game and were successful, so this was the main problem for us. Finally, It was an easy game to finish, leading by 10-11 points and two turnovers changed the game. We still have injury problems with (Nikola) Kalinic and (James) Nunnally but the team reacted in a positive way. We have a lot of games in front of us and must continue to work hard and try to play better. We needed fresh minds and fresh legs in this game and I am very happy that players that came off the bench helped a lot today." 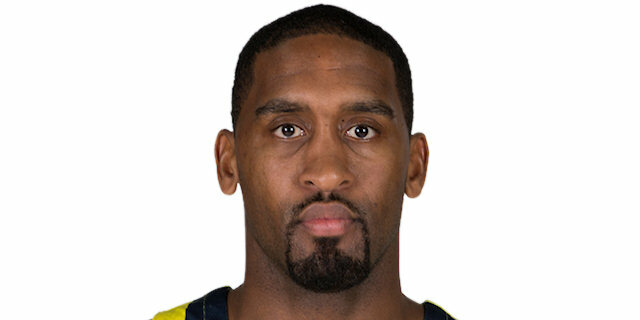 "It was a double round in the EuroLeague this week. Two nights ago, we played a very tough, very hard game against Panathinaikos and we missed playing with more energy today. We started very bad, 10-0 for Efes after two minutes and 15 seconds. After that, it was an excellent game from my players. We played good, with rhythm, moved the ball offensively and came to the position in which we led later the first half. We managed to keep a 10-12 point lead, which is important against a good team like Efes. In the second half, our defense, one-to-one, was in the level that was necessary and everything was good. 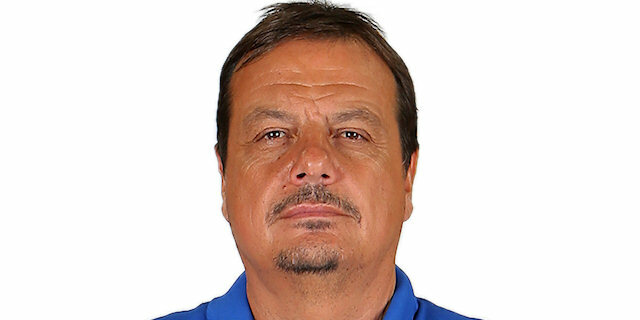 Congratulations to my players for an important victory. Thanks to our fans, one more time, for supporting the team. 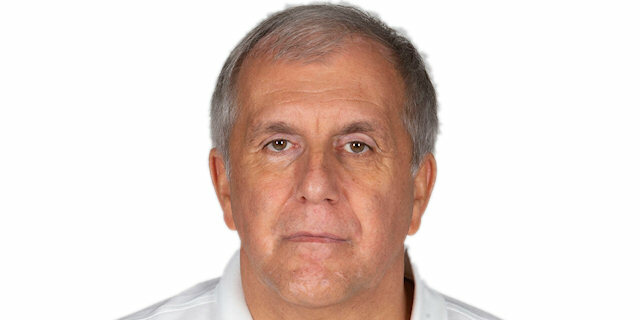 Their support is always very important for us and of course, good luck to Efes in future games in the EuroLeague." "It was a tough game on the road. Every time we play against Efes, it is a very, very special game because it is a derby. They fought and we struggled in the second half but we got the win." "Once we got the ball movement and shared the ball, it is tough to stop us. Obviously, we wanted to finish the game stronger than we did but it is a great team win and played good defense as well."